I would imagine that it must take a very special creative ability to put together a book of short stories that holds the attention of readers who normally love their novels long and involved. The secret to a successful compilation of short stories under one cover must be that each individual narrative tell its complete story in what would normally be one chapter of a regular novel. It must draw the reader in and keep them there, and include character and story line development in a matter of just a few pages. 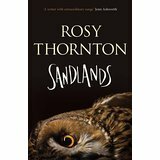 Rosy Thornton has successfully mastered this art in Sandlands. Each story's end was like closing the back cover of a full novel. I had that satisfaction that comes from a good read over and over again in reading this book. Each short story in Sandlands reveals some aspect of Suffolk life. The only way I am familiar with this part of England is actually through a series of detective stories written by Elly Griffiths, so this was an interesting way of rounding out my education, so to speak. Ms. Thornton brings the Suffolk countryside to life in each and every story. Nature is an ongoing theme throughout the book, and each story hits on a different aspect of life in this part of the country. Stories of flora, fauna, history, family, generations, myths and legends, war and peace, witches and the occult, are covered in individual and engaging ways. There are certain locales, like Silly Hill and The Ship tavern that run in and out of the narratives, and the stories on the whole give the reader an excellent feeling for what life is like here, both past and present. My favorite stories revolved around generational themes, especially those drawing on the history of the area during World War II. Each taken on its own merit engages the reader into thinking about things that seem magical and make-believe, but in this corner of the world, might actually be possible. It's a highly recommend from this convert to the short story format.